You remember Dora, don't you? She's one of the three hens from our first year of keeping chickens. She and Reba and Red literally rule the roost around here ...never letting the three newbies we added last spring forget who is in charge. Well, she had a rather traumatic day last week when a Red Tailed Hawk tried to make her his dinner. 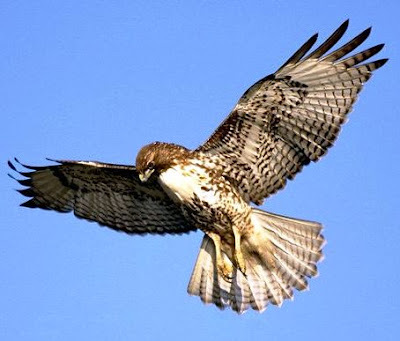 I happened to be home and just happened to look out the back window in time to see the hawk pin her to the ground and to witness her desperate struggle to get free. I was about thirty yards away but slammed the door behind me as I came out of the house, hoping to startle the hawk and scare him away. I yelled and waved my arms as I came out and the hawk finally let go of Dora and took off when I was about halfway down the hill to them. Feathers were everywhere, it looked like someone busted open a feather pillow in the middle of the yard. Dora was lying where the hawk left her, limp and not moving. Her eyes were closed and I thought she was gone. But when I touched her, she opened her eye a little and made a weak attempt at a cackle. I picked her up and just cradled her for a minute, trying to let her know she was okay now. Her little chicken heart was just a fluttering. I carried her to the little brood coop and set her on top so I could check her over. She couldn't even stand, she was so weak, but I felt her all over and found no puncture wounds at all. This is the last thing she might have seen or the last thing her feathered friends might have seen before the attack. A bird of prey zeroing in on it's target is an awesome and beautiful sight ...unless you're the prey. Poor Dora was just scared to death. I'm sure she saw her little chicken life flash before her eyes when she was underneath that big hawk. Satisfied that she was not physically wounded, I carried her with me and searched the coop and the yard for the other five chickens. I finally found them hiding underneath some equipment in the awning next to the shop. Thinking they were all okay, I left the dog in the chicken yard to make sure the hawk didn't bother them and took Dora into the house. 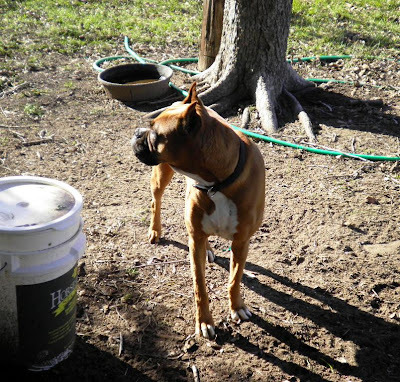 Our dog is a Boxer and that's not your typical livestock guardian breed, but she's an exceptionally good dog and she's been around the chickens since they were just pullets and she was just a pup. She would never hurt them. If she ever tangled with a hawk, she might be hurt but so might the hawk and I was hoping the hawk would be smart enough to know that. I fixed Dora a temporary nest in my laundry basket with newspaper lining the bottom. She still wasn't able to stand, but she seemed more alert and 'talked' if I got out of sight from her. She seemed to want me to stay with her so I carried the basket with me as I worked around the house for the next hour or so. By then, she was starting to stand and though still a little unsteady on her feet, I felt she might be better off down in the coop. I popped a bag of popcorn before I carried her down there ...a treat for her and bait to help me get the other five out of the awning and back into the coop. When I carried her back down the hill, I set her in one of the nest boxes Yeoldfurt built last summer, thinking she would feel safer in close quarters. I gave her a handful of the popcorn and she went right after it, so I was pretty confident she would make a full recovery in time. Coaxing the other five hens out of their hiding place in the awning and back into safety of the coop proved to be a bit of a challenge. We originally only had three hens but we bought some new chicks last spring to enlarge the flock and as replacements for when the original three hens were gone. The older hens tolerated the newcomers but just barely. Before the hawk attack that day, you never would have seen the older hens mingling with the younger hens. 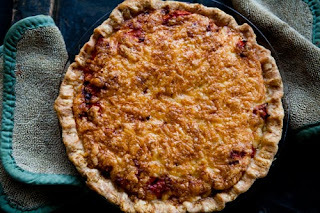 Though they all share the coop at night, the three older hens would be on the roost and the three younger hens would be wherever they could find a spot. But there was definite segregation going on in there. So to find them all huddled feather to feather, beak to beak in a two-foot square space told me they were traumatized as well. Dora was the one that was attacked, but they witnessed the attack and they were traumatized. Microwave popcorn is a real treat though and the familiar sound of me shaking a bag was too much for them to resist. I stood at the doorway of the awning shaking the open bag of popcorn and four little heads popped up from behind their refuge. I tossed a handful at my feet and started backing up the hill toward the coop. Chickens are highly motivated by food and they're also highly competitive about food. All it took was for one of them to make a move toward the scattered popcorn and the others wouldn't be able to resist making a charge themselves. As soon as they were in sight of me, I tossed another handful and they ran toward me ...now halfway to the coop and real safety. I wasn't counting heads at this time. I was just intent on getting them to the coop. Once inside, I scattered several handfuls of the popcorn for them and started counting. I came up one short so I counted again. Still one short. One of the younger reds was missing. Dora was still in the nest box and seemed okay so I locked them in the coop and went back down to the awning. I looked high and low but found nothing. Then I walked the yard, checking every clump of grass, every nook and cranny that could possibly conceal a hen. I was just about convinced the hawk had made off with the missing hen and that Dora was perhaps the second course that day when I decided to check the awning one more time. There is some lumber stacked vertically in the very back corner and it's right next to the metal piece that the other hens were hiding under so I decided to move a couple of pieces and see if she might be hiding back there. Sure enough, when I moved the first piece, I heard a faint chicken gasp ...a kind of 'yikes, something's found me!' sound. I poked my head back there and shined the little pen light into the darkness and there she was ...wide-eyed and looking very ...well ...chicken! I would have thought when she saw it was me and not the hawk or some other scary unfamiliar face, she would have come willingly. But she was not willing at all. I had to move several pieces out of the way and make a grab to finally convince her to come out. It was very tight quarters back there and lousy footing, so I missed when I made the grab. She darted out into the open though and I went after her, thinking I could either herd her back to the coop or corner her and catch her. The riding lawnmower is parked smack dab in the middle of that awning though and she used it to her advantage several times to keep me from getting her out of the awning. She was determined not to go out in the daylight where something might swoop down on her like it had swooped down on Dora. I was finally able to spook her out into the yard and once in the open, she made a beeline for the coop. Chickens are big on personality, not so big on brains ...but they do know where they're safe. Once they were all back in the coop, I topped off their food and water and went back to the house. Twenty minutes later, I looked out the back door and the hawk was back, sitting on a fence post directly across from the coop and not twenty feet from where he attacked Dora. As I watched him, another hawk flew in and settled on a branch a few feet above the fence post. A mated pair ...no wonder they were bold. They probably have a nest in the dense woods that border our property. I couldn't get close enough to get a picture of them together, but this is one of them sitting on the shed roof next to the chicken yard. I think the Red Tailed Hawk is a magnificent bird ...just not when it's trying to eat one of my chickens! 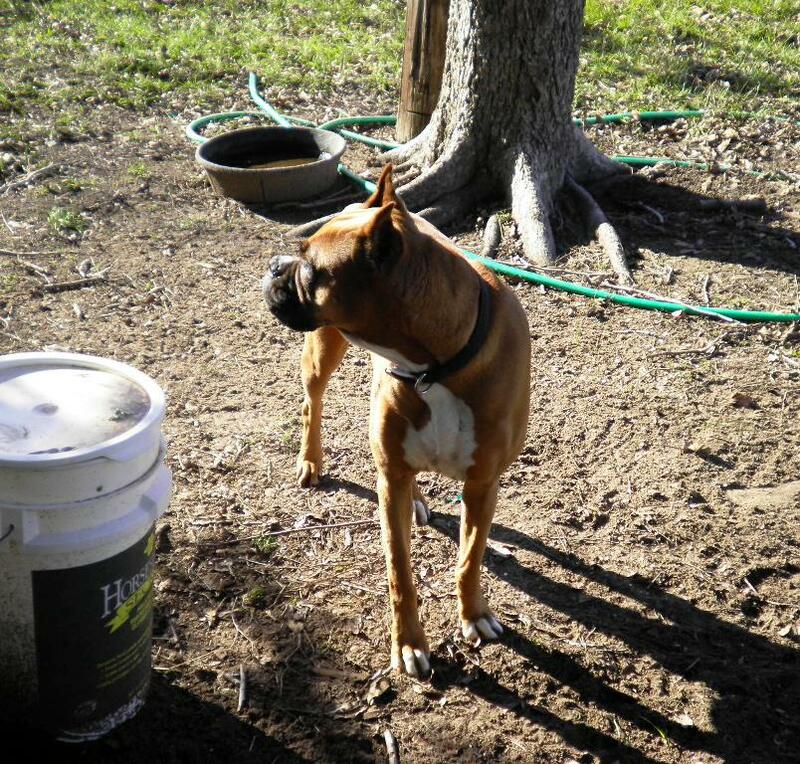 From now on, if the chickens are in the yard, they will have an MP with them ...Mutt Patrol ...Maggie, guardian of her domain. Hopefully, she'll never see action. I'm hoping her mere presence will be enough to deter the raptors. On January 2nd, my friend, Lamb, of Frippery Farm fame did a great post about setting objectives instead of making resolutions for the New Year. The concept is simply to assign a theme as a goal for each month and focus on achieving that goal before the next month rolls around. In theory, the theme for each separate month will help her achieve "No Waste" which is her main theme for this whole year. January's theme is "Organization" and she plans to tackle every room, every closet, every drawer. 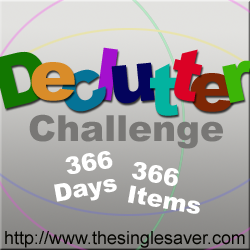 So today, I was happy to see Lamb's post about the Declutter Challenge from The Single Saver blog. Signing up for a challenge might be just the motivation I need to achieve some of these goals so count me in! Read about it here and consider joining us. I double dog dare you!